I’d been suffering from anxiety, depression, low self-confidence, fear, grief, anger – a whole array of powerful negative emotions, all creating emotional and physical mayhem and draining my energy. I felt completely at ease with her from the very first phone conversation with her and throughout all our sessions. Marion has a true gift for easily creating a safe and comforting space to enable painful emotions to be released and inner healing to take place. My journey has had such a positive impact on my life. From my very first session, I began to notice a shift in how I was feeling; my mood lifted and brightened and I felt as though a heavy weight had been lifted from my shoulders. My thoughts became clearer and my energy levels began to rise. For the first time in years, I now get a good night’s sleep. My relationships with those close to me continue to grow stronger and more loving day by day. I have a new understanding of the pain I was suffering and the damage it caused me, and those around me and I feel able to deal with this pain now as it occurs. I have started a new job, given up smoking (after many years of trying) changed to a healthier diet, taken up exercise and lots of lovely new positive people have come into my life. I feel renewed and I feel at peace. I’ve learnt to live in the moment and enjoy my life – I am eternally grateful for having Marion’s help and guidance when I needed it most.. I released such a heavy burden with you and it was at the most, perfect time in my life as I didn’t even know it was there!! I have been able to rid myself of that baggage and move ahead in my life through your help and guidance. And what I love the most was your compassionate, tenacity; you just kept gently, chasing that block until it all came out – and that it did!! Never cried so much in my life. You helped me feel that as a man, it was OK to release such deep emotions. I felt such a relief afterwards, so light. It was truly wonderful. I have had many demons burrowed deep inside me since I was a child. I thought I was strong but I clearly was struggling. I had 3 Emotional Healing sessions with Marion and I cannot thank her enough for what she has done for me. My life is unblocked and I am whole again. And now, because of this, I have been blessed with such amazing events in my life. Why? Because she helped me feel worthy again. Marion is an absolute superstar as a Journey Practitioner. She has done such a profound healing journey herself that she can easily relate to a very vast range of things going on in one’s life. I felt I can fully trust her, I can fully open up to her, I felt supported and encouraged by her. It is so evident she just really wants the client to heal whatever is there to be healed and will do everything in her power to assist in this healing in the most beautiful way. She genuinely cares and cradles the client in a warm embrace of the spirit, I felt. Through the many Skype sessions I have had with her, I have gained self-trust, sense of purpose, I feel I realised my worth so much clearer and so many things in my life are changing due to this and the healthier choices I am now making. Thank you Marion, love you! “Marion Stone does the best facials in the history of the Universe. Except they are not really facials, they are something way bigger and greater than that but they are dressed up as gorgeous organic facials. You get that and then you get a whole deeper thing too. Recommend with a massive tick right in middle of the tick box. “Just had a wonderful healing facial EVER!!!!! Marion Stone is so wonderful that all my ‘lines’ have almost disappeared. Its a miracle. 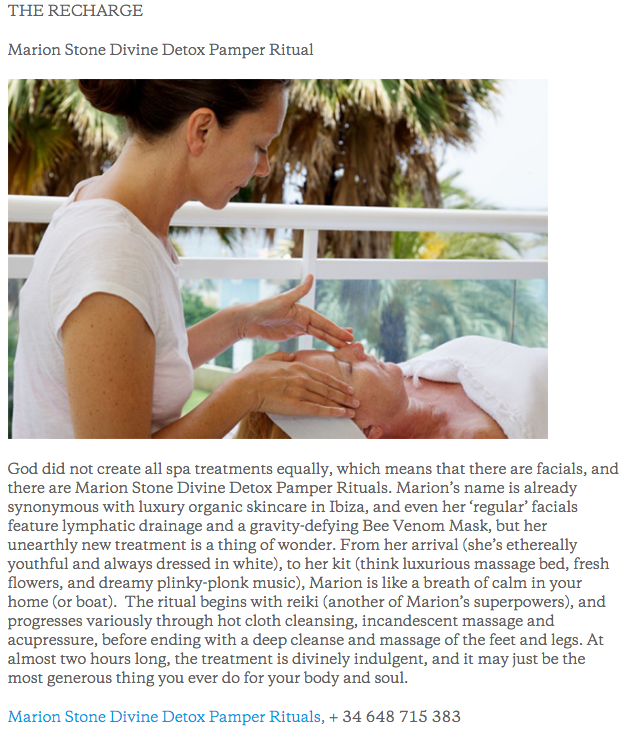 it wasn’t just a facial but a whole spiritual and healing experience. I would advise all my gorgeous female friends to let her rejuvenate your heart body & soul. I can’t believe all my horrible lines have virtually disappeared!! “I loved the treatment and felt amazing afterwards. I felt I learned something energetically and muscularly from the work. I will be so happy to have you come do treatments with our guests in June. “It was lovely to see you yesterday and to have had the opportunity to have such an amazing facial.